Wang SC et al. Cortical forces and CDC-42 control clustering of PAR proteins for Caenorhabditis elegans embryonic polarization. 2017. Nature Cell Biology. 19(8). 988-995. doi: 10.1038/ncb3577. More information on the Motegi Lab. Figure: The schematic depicts the role of cortical tension in establishing cell polarity. The PAR proteins- PAR3, PAR6, and PKC3, which together form one of the major polarity complexes in cells- are diffused throughout in the cortex in the earliest stages of embryonic development (top embryo). Soon after, the tension generated by actomyosin contractility at the cortex induces the clustering of PAR3 and PKC3, and these PAR3-PKC3 clusters are then easily transported by advective cortical flow (represented by black arrows in the bottom embryo) to one side of the cell. The tension-induced asymmetric distribution of PAR complex proteins occurs as the earliest events in the establishment of cell polarity. 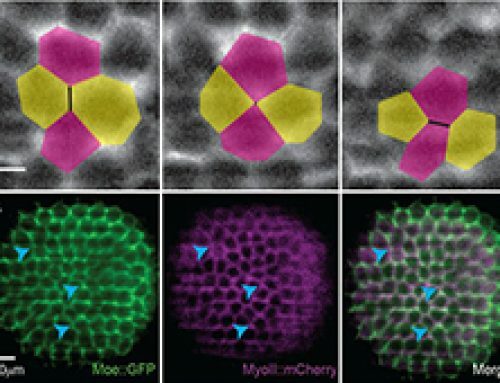 All fundamental cellular processes, such as cell shape changes, division, and migration, depend on their polarization into regions with distinctive structural and molecular arrangements. In the C. elegans zygote (one of the best-studied models for cell polarization), embryonic development starts with the establishment of anterior-posterior (front-back) polarity in cells. However, the finer details underlying this subcellular process were largely uncharacterized. This study proposes a mechanically-driven cell polarization process: the tension generated from the contraction of the actomyosin cortex facilitates the clustering of the polarity proteins PAR3 and PKC3 into high-intensity clusters at the cortex. The clustered PAR proteins have low turn-over rates, and are subsequently passively transported by cortical flows to one end of the cell. This asymmetrical distribution of proteins in cells marks the beginning of cell polarization. The study also highlights the role of the Rho GTPase family member, CDC42, in PAR protein clustering. Active forms of CDC42 were shown to restrict the incorporation of PKC3 and another PAR protein PAR6 into these clusters. How does actomyosin contraction generate tension at the cortex? Which proteins are important for defining cell polarity? Cell polarity refers to the intrinsic asymmetry observed in cells, either in their shape, structure, or organization of cellular components. Most epithelial cells, migrating cells and developing cells require some form of cell polarity for their function. These cells receive information about their surroundings via extracellular biochemical and mechanical cues and translate those information into polarity of the plasma membrane, its associated proteins and cytoskeletal organization. 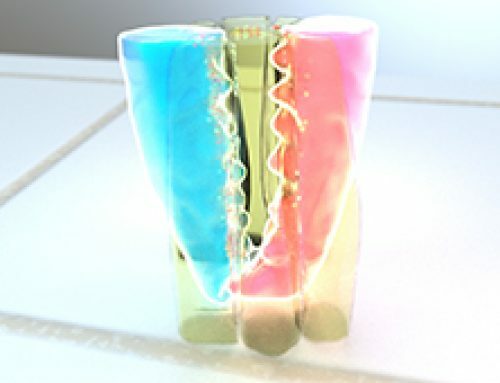 Once established, cell polarity is maintained by transcytosis, in which vesicles carry incorrectly-localized membrane proteins to the correct regions in the plasma membrane. In addition, tight junctions, which act as ‘fences’ against transmembrane diffusion, lock the asymmetry in place. Actomyosin refers to the actin-myosin cortex that forms within the cytoskeleton. 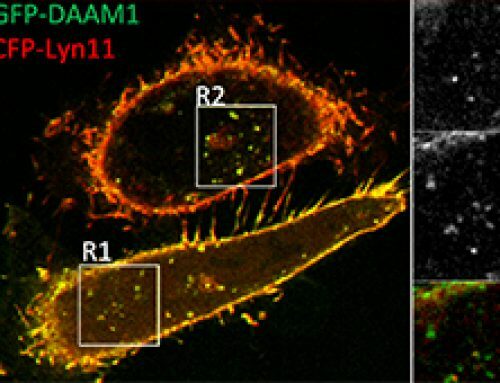 Actomyosin in inherently contractile, with the myosin motor protein pulling on actin filaments. 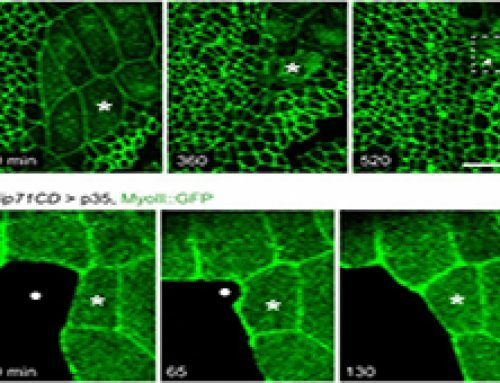 This property gives rise to contractile fibers that form the basis of skeletal muscle, and enable cell motility and force generation in non-muscle cells. In many cell types, higher-order contractile structures that consist of parallel bundles of actin and myosin filaments are distributed inside the cytoplasm. The actomyosin contractile fibers, which are linked at their ends to the extracellular matrix (ECM) via cell-matrix adhesions, exert traction on the ECM that generates tensile forces within the cellular cytoplasm. The intracellular forces generated by actomyosin contractility enable the cell body to translocate during migration, and also serve as a vital inside-out feedback system to regulate actin filament initiation, cell growth, and motility. Three protein complexes are important for defining cell polarity: the Scribble, the Crumbs, and the PAR polarity complexes. While the PAR and the Crumbs complexes are restricted at the apical surface, the Scribble complex is localized to the basolateral domain. The three complexes interact with each other and with a number of cytoskeleton-associated proteins to fine-tune localized signals. The polarity complexes take their localization cue from the adherens junctions and tight junctions. For instance, Par3 localizes to the tight junctions by binding to the junctional adhesion molecules (JAMs) via its PDZ1 domain, while local Cdc42 and Rac activation at the AJs serve to recruit a-PKC to the apical surface. The polarity proteins PAR3 and PKC3 formed high-intensity clusters during the later stages of polarity establishment. The formation of PAR3-PKC3 clusters was driven by cortical tension generated by actomyosin contractility. The formation of PAR3-PKC3 clusters slows down their turn over at the cortex. The stable clusters are then passively transported by advective cortical flows to one end of the C.elegans zygote. The formation of PAR3-PKC3 clusters was regulated by the activity of a Rho GTPase, CDC42. PAR6 clustered with active forms of CDC42, which prevented its clustering with PAR3 proteins. Spinning-disc confocal microscopy and total interference reflection fluorescence (TIRF) microscopy was used for imaging of subcortical regions and image segmentation was used to define cortical clusters of GFP-PAR3 and GFP-PKC3. 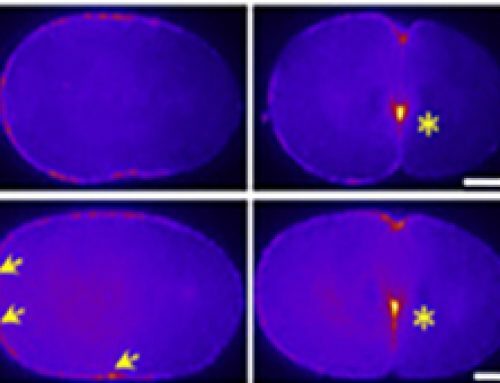 Fluorescence recovery after photo bleaching (FRAP) studies were used to quantify the turnover of PAR3 and PKC3 at the cortex. Particle image velocimetry (PIV) was used to analyze cortical movement and to quantify the orientation and velocity of NMY-2 and PAR3 clusters. This study proposes a simple, force-dependent mechanism that is used by cells to establish polarity, and how the precise control of such mechanically-driven molecular processes is essential to maintain a homeostatic state. 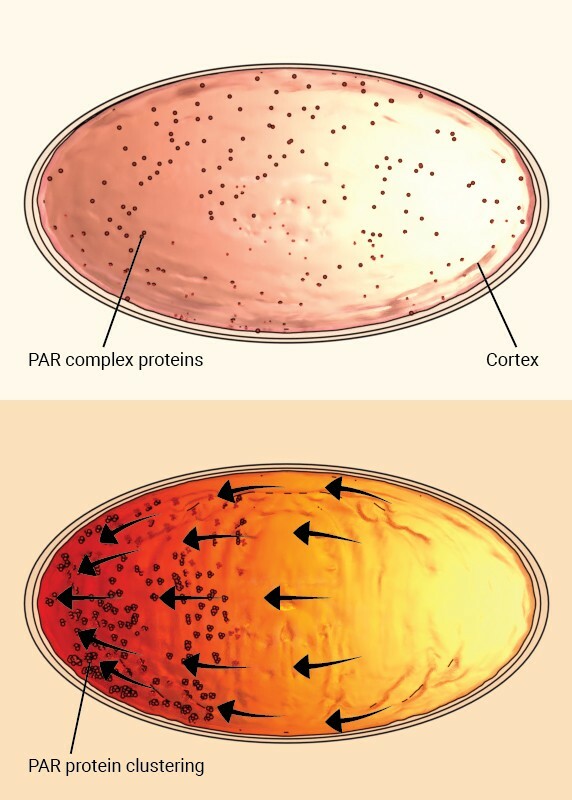 Given the essential role that PAR3 plays in cortical clustering, it will be important to elucidate the structure of the PAR3 oligomers at the cortex in order to understand in detail the underlying molecular and mechanistic principles driving this process during cell polarization.